The Farr 63 Pilot House is the epitome of what a modern cruising yacht should be. She is the largest in the range and of a size that ensures you'll not be short of any of the comforts of home whilst on board. It has been designed with long-term worldwide cruising in mind but also ensuring a couple can easily handle her if desired. The wide beam carried a long way aft allows an expanse below that you will only find on most yachts of 70 feet or over. The interior gives you total comfort even during the most arduous passages. 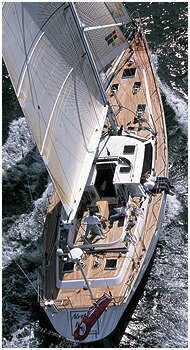 With all the sail systems controlled from the safety of the cockpit she is as easy to sail short handed as she is when fully crewed and partaking in a regatta in one of the more desirable yachting locations around the world. The ability to cover good distances in virtually all weather conditions enables owners to explore the worlds oceans at will. Despite her size, the 63 is a yacht that is exhilarating to sail and has no peer when it comes to performance cruising in style.